Meenakshi Amman Temple is a momentous Hindu temple located at the banks of River Vaigai in Madurai which is one of the most high-up landmarks of the city. The temple forms the heart and lifeline of the 2500 year old city of Madurai. It is devoted to Parvati known as Madurai Meenakshi and her husband Lord Shiva as Sundareswarer. It has around 15,000 visitors a day and around 25,000 during Fridays. There are about 33,000 sculptures and it was also shortlisted as one of the nominees for the “New Seven Wonders of the World”. The history of the temple goes like this. Meenakshi the avatar of the Hindu goddess Parvati, in order to answer the prayers of the second Pandya king Malayadwaja Pandya and his wife Kanchanamalai appeared out of the holy fire of the Putra Kameshti Yagna (sacrifice for childhood) performed by the king. The name "Meenakshi" means fish eyed and is derived from the words "mina" meaning fish and "aksi" meaning eyes. The girl who came out of the holy fire had three breasts. A voice from the heavens told the king not to worry about the abnormality and added that the third breast would vanish as soon as the girl meets her future husband. The happy king named the girl "Tadaatagai" and being the heir to the throne, Tadaatagai was trained carefully in all the 64 sastras, the fields of science. As the time came for Tadaatagai's coronation, she had to wage war on the three worlds across eight directions. After conquering Brahma's Abode, Sathyaloka, Vishnu's Abode, Vaikunta, and Devas' abode Amaravati, she advanced to Shiva's Abode Kailasha. She very easily defeated the bhoota ganas (meaning Shiva's army) and Nandi, the celestial bull of Shiva, and headed to attack and conquer Shiva. The moment she looked at Shiva, she was unable to fight and bowed her head down due to shyness; the third breast vanished immediately. Tadaatagai realized that Shiva was her destined husband. She also realized that she was the incarnation of Parvati. Both Shiva and Tadaatagai returned to Madurai and the king arranged the coronation ceremony of his daughter, followed by her marriage with Shiva. The marriage was supposed to be the biggest event on earth, with the whole earth gathering near Madurai. Vishnu, the brother of Meenakshi, prepared to travel from his holy abode at Vaikuntam to preside over the marriage. After the marriage, the pair ruled over Madurai for a long time and then assumed divine forms as Sundareswarer and Meenakshi who are presiding deities of the temple. Following the tradition, every evening, before closing the temple, a ritual procession lead by drummers and a brass ensemble carries the image of Sundareswarer to Meenakshi's bedroom to consummate the union, to be taken back the next morning in dawn. The marriage is celebrated annually as Chithirai Thiruvizha in Madurai. During the period of Nayakar rule in Madurai, the ruler Thirumalai Nayakar linked the festival Azhakar Thiruvizha and the Meenakshi wedding ceremony. The Meenakshi temple is believed to be founded by Indra (king of Devas, celestial deities) while he was on a pilgrimage to cure his misdeeds. He felt his burden taken off nearing the swayambu lingam (self-formed lingam, a representation of Shiva used for worship in temples) of Madurai. He ascribed this miracle to the lingam and constructed the temple and enshrined the lingam there. Indra worshipped Shiva, who caused golden lotuses to appear in the near-by pool. Tamil literature speaks about the temple for the last couple of millennia. Thirugnanasambandar, the famous Hindu saint of Saiva philosophy, mentioned this temple as early as the 7th century, and described the deity as Aalavai Iraivan. The temple was believed to be sacked by the infamous Muslim invader Malik Kafur in 1310 and all the ancient elements were destroyed. The initiative to rebuild the structure was taken by first Nayakking of Madurai, Viswanatha Nayak (1559–1600) under the supervision of Ariyanatha Mudaliar, the prime minister of the Nayak Dynasty and the founder of the Poligar System. The original design by Vishwanatha Nayak in 1560 was substantially expanded to the current structure during the reign ofThirumalai Nayak(1623–55). He took considerable interest in erecting many complexes inside the temple. His major contributions are the Vasantha Mandapam for celebrating vasanthorsavam (spring festival) and Kilikoondu Mandapam (corridor of parrots). The corridors of the temple tank and Meenakshi Nayakar Mandapam were built by Rani Mangammal. The temple sculpture is a real wonder. The temple has five entrances, covers an area 847 feet (254.1 meters) long and 792 feet (237.6 meters) wide in the North South direction, the circumference of the Adi Veedhi which is the path within the great walls is 830 feet (249 meters) on the east west and , measuring 730 feet (219 meters) from North South direction. There are close to 50 priests in the temple who perform the pooja(rituals) during festivals and on a daily basis. Like other Shiva temples of Tamil Nadu, the priests belong to Shivaite to the Adishaivas, a Brahmin sub-caste. The priests live in a closed area north of the temple.The temple has a six time pooja calendar every day, each comprising four rituals namely abhisheka (sacred bath), alangaram (decoration), neivethanam (food offering) and deepa aradanai(waving of lamps) for both Meenakshi and Sundareswarar. Thepuja(worship) ceremonies are held amidst music with nagaswaram (pipe instrument) and tavil (percussion instrument), religious instructions in the Vedas by priests and prostration by worshippers in front of the temple mast. The common practise is to worship Meenakshi before Sundareswarar. Margazhi (December–January) ritual is prominent one for winning a perfect, god-like husband - it is Meenakshi's ennai kappu festival.Aligned with the cardinal points, the street plans forms a giant mandala (group) whose sacred properties are believed to be activated during the mass clockwise circumambulations of the central temple. 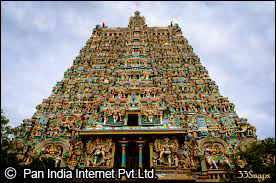 Meenakshi temple no doubt stands as a wonder on earth portraying the excellence of art and culture. By Air: The Madurai airport is situated 10 km away from the city. By Rail: Madurai has the Madurai railway station situated here. By Road: Buses, taxis, auto rickshaws and cycle rickshaws are available to reach the temple.